This basic single-line Lavi Qtrac Call Forward System represents technology at its best for speeding customer service and increasing efficiency. With a simple button-push on Qtrac's wireless remote, agents instantly alert the next waiting customer and clearly and quickly guide them, via the LCD display, to the next open service position using both audio and visuals. This system includes 5 remotes (for five tellers or agents), a 22” monitor, 5 wireless remotes with AC adapter and all software. The custom end product ships from the factory ready to go as for example, window number #4 is to the left, window #1 is to the right. The desired slideshow preparation must be provided by customer, and can include whatever marketing messages desired. Benefits: Increases Customer Satisfaction; Eliminates agent “down time” due to inefficient queuing processes; Decreases average wait time by optimizing customer throughput; Works independently from your other networks, keeping proprietary information safe and secure; Increases impulse purchases. 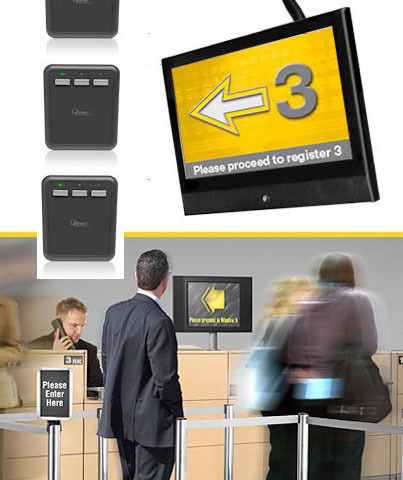 Features: Promotional stills or video can play between queuing prompts to keep customers engaged; Up to 6 different interrupt modes allow media to play full-screen, split screen, or picture in picture; Use the Qtrac LCD display or connect your own monitor; Choose Qtrac’s pre-installed alerts, voices, and images, or create your own; View your configured set-up in real time before going live; Wireless technology makes it easy to add or move station remotes – up to 99; Wirelessly control numerous peripheral devices such as station lights or security doors; Control up to 3 different queues from a single remote with a simple push of a button. Your cost for purchasing this Qtrac single-line basic system is $3,342.65, which includes the factory charge for customizing it for your particular situation. Please call U.S. Bank Supply at 805-218-6106 if this system interests you - and we will be your partner in the process of getting you up and running.. This basic single-line Lavi Qtrac Call Forward System represents technology at its best for speeding customer service and increasing efficiency. With a simple button-push on Qtrac's wireless remote, agents instantly alert the next waiting customer and clearly and quickly guide them, via the LCD display, to the next open service position using both audio and visuals.